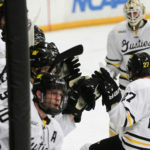 The Gustavus men’s hockey team dropped an offensive battle Saturday night 7-5 to Saint John’s to finish the season 7-17-1 overall and 4-11-1 in the MIAC. 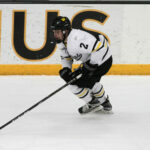 A four-goal second period and a 29-save shutout performance from goaltender Chris Amsden (Jr., St. Peter, Minn.) propelled the Gustavus men's hockey team to a 4-0 victory over Bethel University Saturday evening, completing the series sweep. 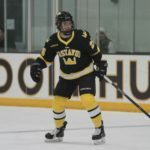 The Gustavus men's hockey team concluded play at the Minnesota Intercollegiate Athletic Conference Showcase Saturday evening with a 1-1 draw against Concordia College Saturday evening.